Nylon Rope Leads are traditional working leads that were created for rural pursuits, that are functional and suitable for all dogs, not just those owners who use their dogs for retrieval of game. We stock reflective rope dog leads that are intertwined with reflective strands, that have triggers to allow you to attach them to a standard dog collar, which shine brightly in lights at night, making sure that walking your dog is a safer experience. 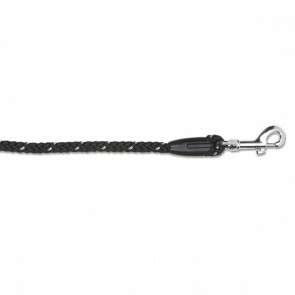 We also stock traditional Nylon Slip Rope Dog Leads that do not require you dog to wear a collar, they have a ring and leather keeper to allow you to adjust the size of a loop effortlessly, that fits over your dog's neck whenever you need to control the behaviour of your dog. Rope Dog leads are soft and comfortable to use, as well as strong, weatherproof, resistant to dirt, easy to clean and practical as they can be scrunched up into pockets, when not in use! Rope dog leads are the original working dog lead that were created for pure functionality, to allow owners to quickly store away a lead in a pocket in seconds, without it becoming tangled up and are still used by many professional dog owners today, including dog trainers, gun dog owners, police dogs, farm dogs, sheep dogs and farmers who like the convenience of rope or slip lead, rather than a standard collar and lead combination. Rope Leads: 5 stars out of 5 based on 0 user reviews.